“Lossy” and “Lossless” are terms used to describe two different kinds of compression. This article will explore the differences, pros and cons of each compression type. Lossy compression lowers a file’s quality. When compressing, an algorithm scans for and tosses out files it deems unnecessary. Lossy compression is used when a file can afford to lose some data. It is useful because it saves space. As long as space is not a problem, it should not be necessary to use lossy compression. Lossless compression, as you may have guessed by now, is used when quality is of utmost importance. The higher quality comes at a cost of larger file size. Photographers enjoy using lossless compression, as many use RAW images. This is a form of lossless compression for images. These gigantic files are perfect for editing and fine-tuning in Photoshop. Once the photoshop edit is complete, the image is converted to JPEG (or similar) at high quality. This is then presented to the client. There is no “best”. It depends on what you plan to do with your files and how much storage space you have available. Unless you value top quality – then lossless is best. I had a photographer friend with a serious storage problem, because of how much data RAW images take up. They took hundreds, sometimes thousands of photos every day. Each of these was around 25MB and more. 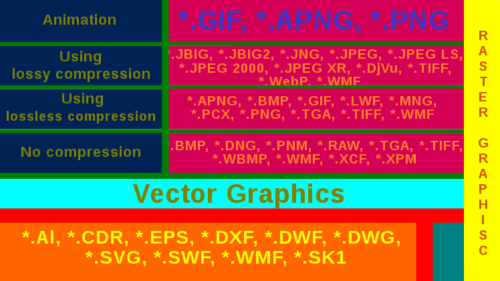 A few lossy file types used for images are JPEG’s and GIF’s. Both of these lose some quality at conversion. Files types RAW, BMP and PNG are all forms of lossless compression. They keep their quality at the expense of huge storage space. In audio lossy files are MP3, MP4 and OGG. Lossless files are WAV, FLAC and ALAC (used by itunes). In video there are few lossless file types. The sheer (and shocking) size of lossless video file types make them almost inaccessible to mere mortals. Lossless video files, I’d imagine, are used by major movie studios. If you don’t mind losing quality, it’s fine to convert from lossless to lossy. It is a viable option when running out of space or when the need to have the lossless files has passed. Converting from lossy to lossless is not advised. The quality won’t improve, since the unnecessary files deleted will never return. But the file size will grow significantly. If the file is then returned to lossy compression, further quality loss will occur. Converting from one lossy file type to another is also not recommended, as more quality will be lost with each conversion. Whenever you have a crucial document (like financial data), it is recommended to keep a lossless file format. Any files where a great loss of quality would incur costs or damages, the files should be kept in lossless format. Less crucial documents can safely be converted to lossy file types. Videos commonly come in the MWV or MKV file types. There’s a new file type, however, called H.264. I haven’t seen this file type myself yet, but, apparently, it’s better than MWV. It has a better algorithm which decided what to chuck, and ends up with smaller, higher quality files. According to pavtube, the MKV file format is lossless. Personally I doubt this, as I recently had MKV video files. The video itself was great, but the audio was pretty poor. Have you worked with MKV or H.264 file formats? Have you worked with other lossless video? Kyle Ferreira. "The Difference between Lossy and Lossless Compression." DifferenceBetween.net. May 2, 2017 < http://www.differencebetween.net/technology/the-difference-between-lossy-and-lossless-compression/ >.